I just conducted my first concert from my iPad. I also used ForScore and imported my music either by using my scanner or, for arrangements I had done myself, printing to a PDF file from Finale. I have spent the past year using my iPad exclusively for both rehearsal and performances and it has changed my life. I use ForScore as the app to read the music, but when I paired them with the AirTurn foot pedal when at the piano, and the Jot stylus I am able to run rehearsals with a fluidity and ease that was just a dream a year ago. My previous habit of using only pencil to mark my music so changes can be erased has been replaced with the option to write in the score in a multitued of colors, as will as a choice of thickness and darkness. The ability to type directly on the score in a varity of fonts, colors and sizes was an unexpected benefit. Having limitless highlight choices is extremely handy as well. The option I was surprised to find but which I have come to use often is the “White Out” feature. When combined with ForScore’s rearrange feature, it is possible to see all of the music that is to be performed start to finish in one continuous path without the need to jump and skip over or back to sections. I was stunned when I realized how much brainpower I use in just keeping on track, especially when leading a piece filled with repeats, del Signe and Coda sections. I can now hear so much more of my chorus’ singing when my music is a “stretched out” before me. Little things like the built in pitch pipe, piano keyboard and the metronome are so very handy. Just last night, I had the lead of our production come to me asking for help during a break, and I was able to show her the part in question, pull up the piano keyboard and help put her mind at ease all while the cast was making noise as if they were at a cocktail party. There was so need to climb into the orchestra pit to get to the piano. There is a learning curve to feel comfortable using the iPad, but very quickly I came to realize that I would never go back to a backpack filled with paper scores, and pitchpipes, and metronomes, and colored pencils, and highlighters, and white out again. I have been pondering the apparent distrust of the use of the tablet by some, and its seeming purpose to cheat composers out of their livelihood. I, for one, am anxious for more composers to recognize this is a tool we will continue to use and provide ways for us to simply put the music on our tablets. [Composer] Michael McGlynn has devised a simple yet effective way to get his music in our hands while maintaining control over the number of legal copies distributed. I am truly unwilling to check out any unfamiliar composers who resist this way of doing things when there are so many excellent composers who are embracing the multitudes who have made the switch. Well, the ink is hardly dry on my previous blog post, Web search tips for thematic programming of a concert/recital, and now fellow techie singer Katia H. has created a search tool that searches all of the websites mentioned in my post, in one fell swoop! It’s over at classicalsongsearch.com. It’s still in alpha so there still might be some kinks to work out, but give it a whirl and let Katia know if you have any problems or suggestions! So one of the things that’s been sucking away at my time for blog-writing these last couple months is that I’ve been organizing and programming a benefit concert. While hunting for pieces related to the concert themes, it occurred to me to share some of the Google-fu that I use for finding music. I’m sure these tips are old hat to some of you tech-savvy singers, but others might find them useful. Several of these sites contain texts in various translations, so I made sure to search for translated versions of my keywords, too. E.g., in addition to searching for “gold” I would also search for terms “oro”, “d’or”, etc. (It had to be “d’or” for French since “or” would yield too many search results in English texts!) Translating the search terms is less necessary for some of the sites, like The Lied, Art Song, and Choral Texts Archive and Aria Database because they have English translations of many texts, so my keyword search for “gold” will still yield songs in other languages. Other sites like Opernführer might only have the libretto in the original language or in German, for example, so translating the search keywords is a definite help there. Once I found song texts that fit my programming theme, I was able to track down scores for songs through online sheet music sellers, IMSLP, CPDL, or by using WorldCat to find scores in libraries local to me. 8/26/13 UPDATE 1: Fellow techie singer Katia H. has created a search tool that searches all of the websites mentioned above, in one fell swoop! It’s over at classicalsongsearch.com – check it out! This is great advice. Many folks may not know of the many massive reference books on vocal repertoire that were written by Sergius Kagen, Noni Espina, Michael Pilkington, Judith Carman, Graham Johnson, Shirley Emmons and Carol Kimball. A very useful reference is Pazdirek, the BBC Song Catalogue and Classical Vocal Music in Print and of course Groves and MGG. I don’t know, but possibly some of these books may now be on Google books. Working with music texts, Part 1: Find the text online, then sync it to the cloud! I’ve gotten on the Spotify wagon during the last few months. People have been telling me about it (e.g. here’s an earlier blog post about one musician who uses it for audition prep). But I was resistant to installing yet another desktop app and creating yet another online account, and I was also unclear whether it was free or paid. But recently I’ve been looking for pieces to program for a concert, and I got sick of wading through so many low-quality recordings and performances on YouTube. (To be sure, there is a lot of excellent stuff on YouTube, but for some kinds of music you can waste a lot of time sorting through poor recordings and coming up empty-handed.) So I finally checked out Spotify and discovered that their free desktop offering is actually quite compelling – you can access tons of high-quality professional recordings of classical and other music and play songs on-demand. They also have a paid service for $5-10/month with more features and no ads. 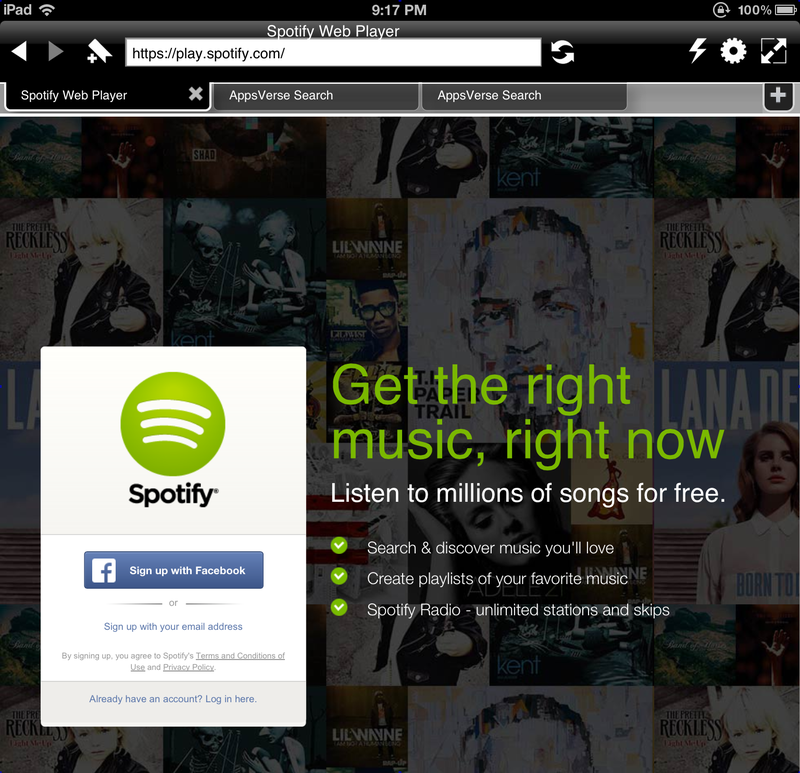 First, visit the Spotify website and sign up for a free account. The main Spotify screen will reload without the error message and you will be able to access your playlists and search for songs and play them. All for free – no premium subscription required. Anytime Spotify give you a “Please install Adobe Flash” error message, just tap on the lightning icon. In Photon Browser, if you ever get a strange website that doesn’t look like Spotify or any other website you’re attempting to visit, just quit and restart Photon Browser and the flash browsing session. This happened to me once. But if you can live with the browser quirks and don’t mind being online in order to play Spotify music on-demand on your mobile device, this is a very useful, convenient, and no-cost way of doing so. Photon Browser is available for both iOS and Android. If you try this method out on your iPhone or Android device, let me know how it turns out. Recently I came across a blog post by Heather Roche, a clarinettist living in Germany, who shared some of her experiences with using the iPad for music and performance along with pros/cons. I wanted to share her informative post along with some of my reactions. Here’s the original post: why iPad? I’ve been known to use [the AirTurn Bluetooth pedals] when I’m reading a document on the iPad and knitting at the same time, thus dispensing with the need to ever put my knitting down! Love it! The AirTurn pedals seem pretty useful for hands-free page-turning of sheet music, but I had never considered their advantages for knitting! There is also a stand attachment that attaches to a microphone stand, which fits the iPad perfectly (called the Gig Easy). I’ve never used mine, however. First of all, I’d have to carry a microphone stand around with me. Secondly, if I’m playing with an ensemble, it would look very strange if we weren’t all using similar looking music stands. I’ve had my eye on the Gig Easy stand – I was going to ask for one as a birthday gift until I saw the price. I’m not sure I can justify it when I already own music stands that will do. I do wish I had a better way of securing the iPad to my wire stand or my Manhasset stand so I don’t worry about the iPad falling off. That’s one advantage paper music still has – I can pick up and move the stand with the music still on it, without courting (major) disaster. I did come up with this ad-hoc method of attaching the iPad to my wire stand – not particularly attractive, but it works. Maybe the KICMount magnetic iPad case could be used to stick the iPad securely to the desk of a traditional music stand? It has taken some getting used to – the first few concerts I played felt a little more stressful than I would have liked. ForScore went through a phase where it crashed occasionally, which has happened twice in concert, though in hindsight it was no more disastrous or time consuming than some of my sheet music falling off the stand. […] ForScore crashing during a concert was possibly one of the most frightening moments on stage. Although as I wrote above, it hasn’t happened for months now, so they’ve quite possibly sorted that problem. Amen to this! I have had forScore crash a few times, but not during a performance. What I usually do right before a performance or other situation where I need high reliability is to close all of the open apps on my iPad, including forScore, and then re-launch forScore. I’ve noticed that it does help. I’ve occasionally run into intolerable bugs on forScore – the worst being the one where annotations from one page would get “stuck” on the screen for all pages. But it’s been many months since I’ve seen that one, so presumably they fixed it in forScore 5. A full day of rehearsal with hand werk can drain the battery of my iPad almost completely and an iPad takes all night to charge. It’s not a problem as long as one is prepared, but it’s another thing to get in the habit of thinking about. I’ve been thinking that for a full day of rehearsals or gigs, I ought to get some kind of external battery/charger for the iPad – the ones that can use either solar power or wall power would be really sweet. Discussing aspects of working off the iPad with your colleague who uses one will annoy the colleagues who don’t use it to no end. Oops. Sorry, guys. LOL! So I’m not the only one. Q. What about other tablets? Q. Aren’t the notes often too small? A. There are a few answers to this. Yes, often the notes are much smaller than one would expect or want with paper, but often, the smallness is made up for by the extreme clarity provided by the screen and its backlighting. Secondly, I often edit scores so that they can be more easily read. It doesn’t matter how many pages you have, as page turns are no longer problematic, and even though it takes some time to find the best process for you (I started by making .pdfs with keynote, pasting bits of the score into blank slides until I was done — now I create multiple copies of the same page in ForScore and use the ‘crop’ feature), in the end it’s faster for me than having to cut up a part for performance. I look forward to more of Heather’s writings on her use of the iPad as a working musician. In the meantime, if you’re a musician who’s getting started with a tablet, or curious about what a tablet can do for you, the Going Digital for Musicians blog is a good starting point (it’s really an e-book, so start with the first post). On my own blog, there’s an archive with several posts about how musicians can use iPads/tablets and a link to my forScore video tutorials. The posts Using iPads and Tablets for Choir Rehearsal and Performance and Brainstorming iPad choir rehearsal guidelines on Twitter cover rehearsal/performance considerations and “stage ettiquette” when using a tablet, many of which are applicable to other musicians besides choristers. And just for fun, there’s my Pinterest pinboard with sightings of Sheet Music on iPads and Tablets in the wild. I was inspired to compile a list of streaming internet radio stations that are of interest to classical singers, after reading a thread on this topic on Facebook some weeks back. You can listen to these audio streams on your computer using your web browser; on mobile devices, you can use an app like TuneIn to access most (not all) of these audio streams. For some channels, e.g. Operavore, the player on their website provides more real-time information about the work, performers, and composer than you get through an app like TuneIn. Other channels do display that information within the TuneIn interface. If you have suggestions for streaming audio channels that belong in this list, let me know in the comments section. 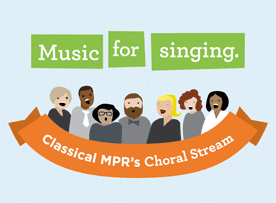 Their channels include Opera, Mass/Chorus/Cantata, and even a station devoted to popera, if that’s your cup of tea. The TuneIn app was the most straightforward way for me to listen to these channels, since the web page required browser plug-ins that I was unsuccessful in installing. If you do use the TuneIn app, you’ll need to search on the exact title of the channel in order to find it, due to the large number of Radio Caprice channels, so search for “Radio Caprice Opera” or “Radio Caprice Mass/Chorus/Cantata”. Speaking of which, the Radio Caprice website lists a huge number of musical genres for which they have channels, 2/3rds of which I have no idea what they are (what is “funeral doom metal”?). One annoyance I’ve had with the iPad is that normally there isn’t a way to simultaneously listen to YouTube recordings in the background while using other apps. If you try to switch to another app while the YouTube video is playing, the audio will stop. I ran into this situation a couple of time recently: once when I wanted to listen to a Le nozze di Figaro YouTube clip while viewing the Bärereiter score on the excellent Neue Mozart-Ausgabe website, and another time when I wanted to listen to a bunch of Wolf lieder on YouTube while reading their texts and translations on The Lied, Art Song, and Choral Texts Archive (also an excellent site) and consulting a song literature reference book that I digitized and put on my iPad. Jasmine app, which is an alternative viewer for YouTube and currently available on iOS 6+ only. I’ve heard that it’s supposed to support background audio – but I’ve also seen app reviews suggesting that this capability might have gone away in the iOS 6 version (possibly due to limitations in iOS 6). At any rate, if it doesn’t work, you won’t lose, because the app is free and I’ve also heard several users sing its praises as a great alternative to YouTube’s native app/website. Play Tube app, which is another alternative viewer for YouTube. This is what I use, since it also supports iOS 5. The background audio definitely works for me. I fire up the video in Play Tube, and once it’s done buffering and actually starts playing, I can switch over to my other apps like forScore, Safari, or iBooks in order to view scores, libretti, and other reference materials while listening to the recording on YouTube. You can also create locally-stored playlists within the app and have those play in the background. I think there is also a way within the app to log in to your YouTube account and create/manage/play the playlists in your account, but I haven’t tried that yet, so I can’t confirm. Sometimes there is a little hiccup in the audio the first time I switch from Play Tube to a different app while the video is playing, but it’s not too big a deal. Open Safari and navigate to the YouTube website. Find the video and start playing it. Double-click the Home button on your iPad to bring up the recent apps bar. The audio will stop. Switch to the other app you want to use. Double-click the Home button again on your iPad to bring up the recent apps bar. Swipe left to right on the recent apps bar until the music controls appear. Press the play button. The audio will resume and you can now use the other app while the audio plays in the background. Frankly I don’t like this method as much because it requires more tapping and swiping than just using an alternative YouTube viewer app. Also, you have to go back to the music controls and press the fast-forward button to advance to the next track in a playlist. But it’s useful as a backup method if for some reason you can’t use an alternative YouTube viewer app.